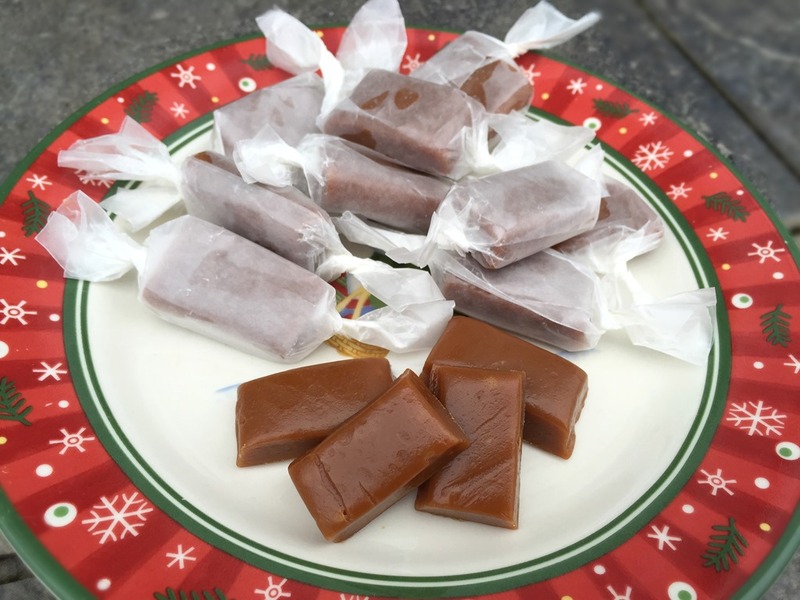 Soft and chewy homemade caramels. This recipe uses sweetened condensed milk, so they come together faster than starting with a true caramelized sugar base. This method also produces very consistent results, with little chance of gritty caramels or seizing. If you don’t have (or don’t want to use) sweetened condensed milk, try this recipe for Salted Caramel Sauce, and cook it to about 245°F. The hardest part of making these is not popping one in your mouth every time you walk past their container. Line an 8×8” pan with parchment paper, allowing the paper to hang over the edge on 2 sides. Combine butter, sweetened condensed milk, brown sugar, corn syrup and heavy cream in a large saucepan. Bring to a boil over medium heat. Place a candy thermometer on the side of the pan. Reduce heat to medium low, maintaining a low but continuous simmer, until caramel reaches 245°F, stirring occasionally. This will take about 25-30 minutes. Remove from heat and stir in vanilla and salt. Pour hot caramel into lined pan (do not scrape the sides of the cooking pan when you pour it into the square pan). Cool, uncovered, at room temperature until completely cooled and firm. Remove from pan and cut into pieces. Wrap individual pieces in waxed paper. CARAMEL FILING OR SAUCE: To use as a filling for thumbprint cookies, or as a caramel sauce, cook caramel to 235°F (soft ball stage) for caramel filling, or slightly lower for a caramel sauce.